Heather Mekkelson told me that “the urban landscape is the primary impetus” for her latest installation “Absentia Luci,” currently on display at Hyde Park’s 4th Ward Project Space. Hers is the only work in the room. 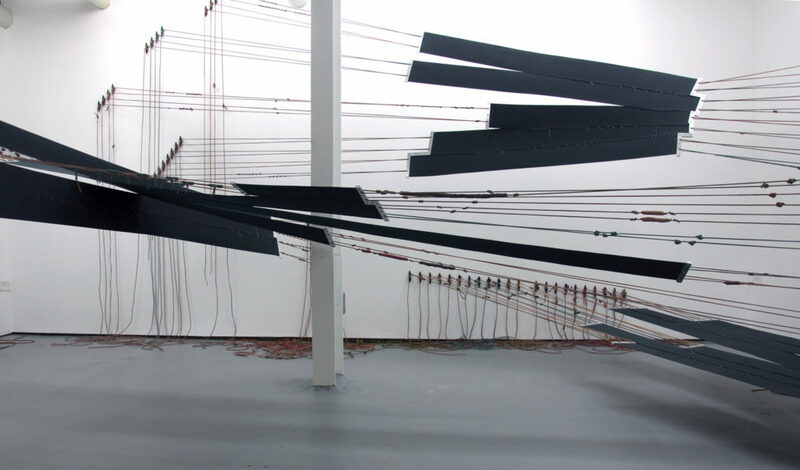 Paracords bisect the blank white space of the gallery like telephone lines, staunch and powerful in their ability to demarcate the human experience from above. Each cord has been toned with what Mekkelson called “a light-pollution mauve,” a pastel purple evocative of the city sky, which is itself a combination of natural light and that cast by Chicago’s sodium vapor street lamps. She described her conceptual square one when planning “Absentia Luci” as “what it would be like to have all of the light erased,” making the 4th Ward Project Space’s exhibition room ideal for the piece. The room has no windows; it is austere, unadorned, and thus devoid of the constructive and destructive interaction of light sources that characterizes the urban experience, giving it a functional similarity to a “blank canvas” for Mekkelson.